There are going to be a lot of firsts for the Roadrunners this season. Scratch another one off the board. 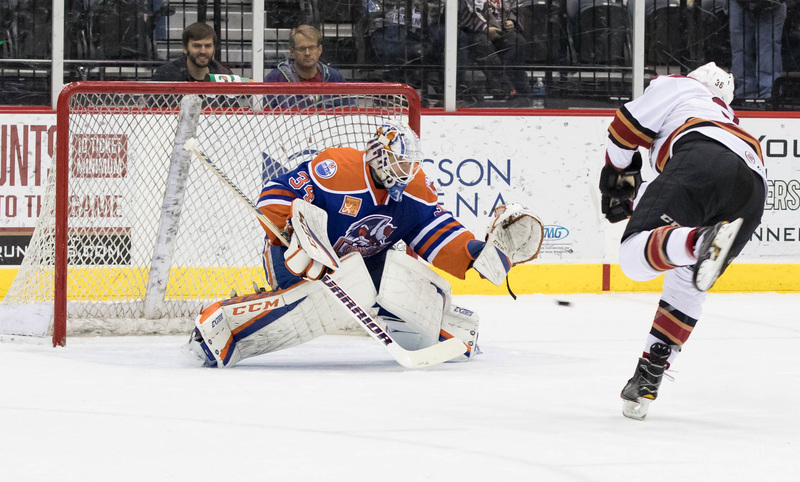 In extending to the first shootout in franchise history Tuesday night, the Roadrunners came away victorious in their 4-3 win over the Bakersfield Condors at Tucson Arena. Christian Fischer and Kyle Wood – the game-winner – netted goals in the shot competition while goaltender Justin Peters turned away both of Bakersfield’s attempts to secure yet another two points earned on home ice. “I have it in my head, we do some shootouts in practice, you go by some feel, we lucked out tonight, and it worked,” said Mark Lamb of his approach in selecting his shooters in the team’s first go-around in such a situation. Tucson got off to a ramped start in Bakersfield’s first visit of the season, netting three first period goals in a less than 10-minute span, building an early, commanding lead. 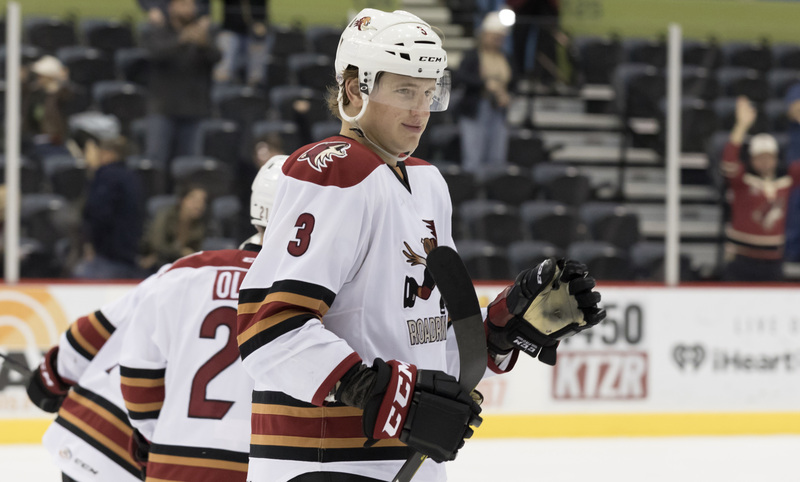 Defenseman Kyle Wood opened the scoring for the Roadrunners on the team’s first power play of the night, walking in and firing a wrist-shot past Bakersfield’s Laurent Brossoit after getting turned away on a couple of one-time attempts from the high point. “I had time, I just walked down a little bit, saw something short side, and just put it in,” Wood said of his seventh goal of the season. Just over three minutes later, Christian Fischer gave Tucson a two-goal lead when he pounced on a chip pass from Laurent Dauphin getting inside positioning on a defender to beat Brossoit from close range. For Fischer, it was the 19 year-old’s sixth goal in four games. Jamie McBain gave the Roadrunners a 3-0 lead with just under eight minutes to play in the first when his wrist shot found its way through traffic, beating a screened Brossoit. Bakersfield swapped goaltenders following McBain’s goal; Nick Ellis came in for relief of Laurent Brossoit, who allowed three goals on seven shots faced through the first 12:16 minutes of play. In the second period, the Roadrunners took three consecutive penalties, and it cost them; Bakersfield capitalizing for a pair of power play goals to cut Tucson’s lead to one. Early in the final frame, the Condors struck for their third power play goal of the evening to tie the game 3-3. The Roadrunners extended to their eighth overtime game of the season, and their third in four games, deadlocked in a tie after 60 minutes of play. Neither team scored in overtime, and for the first time all season, Tucson found themselves in a shootout. Electing to shoot first, Christian Fischer opened the scoring for Tucson in the first round. Justin Peters stopped the two attempts Bakersfield brought his way. Laurent Dauphin was turned away in the second round, and Kyle Wood clinched the affair with his goal in the top of the third round. Mark Lamb, who’s seen the heavily statured defensemen execute on shootout attempts in practices, went with his gut feeling, and also the hope that Bakersfield’s Nick Ellis would have no idea what Wood would bring to the table. Jamie McBain (1G, 1A) lead all Roadrunners players in points scored (2), Christian Fischer in shots taken (6). Justin Peters made 35 saves in the win. The Roadrunners will be back on home ice at Tucson Arena Wednesday night to complete their two-game set with the Bakersfield Condors. The puck is set to drop just after 7:05 PM.